Immanuel Bloch, a professor of physics at the Johannes Gutenberg-University in Mainz, Germany, has won the ICO Prize 2005, celebrating the World Year of Physics. 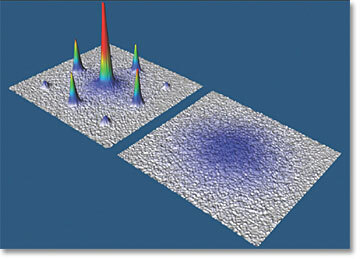 Based on the first realization of Bose-Einstein condensation, by Nobel-Prize winners Wolfgang Ketterle and US Physicists Eric Cornell and Carl Wieman, Immanuel Bloch has become the first to crack the Bose-Einstein condensation wave and regularly arrange several hundred of these special atoms into a glowing grid or optical lattice. In the future, this type of optical lattices could make up the basic elements of a new kind of matter state with application in quantum computing. The proposal of the ICO Prize Committee for this year, celebrating the World Year of Physics, has been to deliver it to Dr. Immanuel Bloch from the Johannes Gutenberg-University of Mainz, Germany. This proposal was unanimously approved by the ICO Bureau held in Changchun (China) last August. The award citation reads: "The ICO Prize for the year 2005 is given to Dr. Immanuel Bloch in recognition of his outstanding contributions in the areas of condensed matter physics, quantum optics, quantum information and atomic and molecular physics. These achievements were done as a researcher younger than 40 years old". Immanuel Bloch (33) is full professor of physics at the Johannes Gutenberg-University of Mainz, Germany. His research interests include the investigation of ultracold bosonic and fermionic quantum gases, with special attention to applications in the field of condensed matter physics, quantum optics, quantum information and atomic and molecular physics. His recent research has focused on exploring ultracold quantum gases in artificial periodic potentials formed by laser light, so called optical lattices. Such optical lattices create a potential landscape of hundreds of thousands of small optical tweezers like microtraps, in which the atomic gases can be trapped. Among the research highlights of Immanuel Bloch are the first experimental observation of a quantum phase transition from a superfluid to a Mott insulating state of mater, the observation of collapse and revivals of the macroscopic quantum field of a Bose-Einstein condensate (BEC) and the realization of collisional quantum gates for large scale entanglement and quantum information purposes. Very recently his group was able to establish Hanbury Brown & Twiss type noise correlation techniques for the detection of strongly correlated many body quantum phases of ultracold atoms in periodic potentials (Nature, 2005). Immanuel Bloch studied physics at the University of Bonn, with a subsequent research visit to Stanford University. He received his PhD from the Ludwig-Maximilians-University in Munich for his work on atom lasers and phase coherence properties of atomic BEC in the group of Theodor W. Hänsch. Subsequently, he became junior group leader for ultracold quantum gases at the Max-Planck-Institute for Quantum Optics, Garching and the Ludwig-Maximilians University in the same group. Since October 2003, at just 31 years of age, he was appointed to full professorship of physics (C4) at the Johannes Gutenberg-University in Mainz, Germany. He has received several prizes for his research activities, among them the Otto-Hahn medal of the Max-Planck society (2002), the Rudolf-Kaiser prize (2003) recognizing his work on ultra-cold quantum gases and the 2005 Gottfried-Wilhelm-Leibniz prize of the Deutsche Forschungs-gemeinschaft (DFG, German Research Foundation), considered the most valuable prize in German research. It is expected that Immanuel Bloch will deliver an invited plenary lecture at the forthcoming ICO Topical Meeting in Optoinformatics, that will be held in Saint Petersburg, September 2006, and were the corresponding award ceremony will take place as well. The ICO Prize Committee, chaired by Prof. Asher Friesem and comprising Profs.Henri H. Arsenault, Guofan Jin, Giancarlo Righini, Bahaa E. A. Saleh and Andrew M. Weiner is now seeking nominations for the 2006 ICO Prize. Nominators are asked to follow the instructions given at the ICO web site. Nominations should be sent by April 15, 2006 to Prof.A. 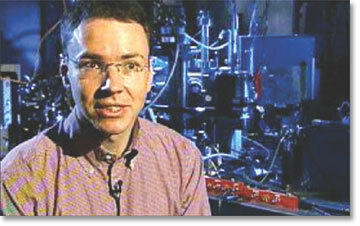 Friesem, Chair of the Committee, Department of Physics of Complex Systems, the Weizmann Institute of Sciences, P.O. Box 26, Rehovot 7610, Israel, fax +972 89344109, e-mail: friesem@wicc.weizmann.ac.il. Opening ceremony of ICO-20 at the Hall of CIOMP. The opening was chaired by the President and Vice President of the Chinese Academy of Science, Yongxiang Lu and Jianlin Cao, respectively, who sent their warm welcome to the congress delegates. ICO holds its General Congress every three years, consisting of a scientific meeting and the triennial General Assembly of the Commission. 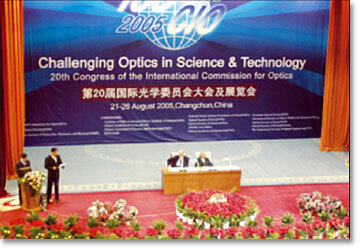 ICO-20 was held at the Changchun Institute for Optics and Fine Mechanics (CIOMP), Changchun, China, 22-26 August, 2005. More than 900 attendees, from 34 countries all over the world, met for the scientific part of the event, which consisted on eleven parallel scientific sessions: Optical Devices and Instruments, Optical Communications, Biomedical Optics, Optical Information Processing, Lasers and Laser Technologies, Materials and Nanostructures, Display Devices and Systems, Remote Sensing and IR Devices & Systems, MEMS, MOEMS and NEMS, Illumination, Radiation and Color Technologies and Optical Design and Fabrication, together with corresponding poster sessions. 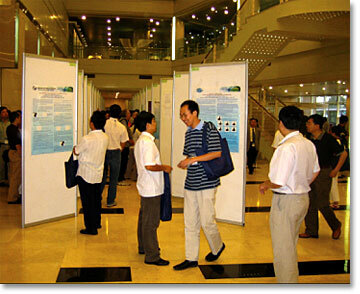 An active ambiance of discussion at the poster sessions. More than 1000 papers were submitted for presentation at ICO-20, and the Program Committee selected around 830 of them. The congress started with 3 plenary sessions having the following lecturers: Charles H. Townes, Nobel Prize in Physics 1964, "Development of the Science and Technology of Electromagnetic Waves" in which he demonstrated that dynamism and enthusiasm is possible at the age of 90. Jianlin Cao: "The current state and progress of optics in China", which he presented statistics showing the emergent potentiality of optics and photonics in China (with currently 150,000 PhD students). Tingye Li, from AT&T Labs presented: "Innovations, economics and applications: revolution and evolution in optics communications". James C. Wyant: "Advances in interferometric surface measurement". A. W. Lohman and J. Jahns: "Diffractive optical processing of temporal signal" and H. Philip Stahl: "NASA's challenge in optics for future space-based science missions". The Award Ceremony and third plenary session consisted on the presentation of awards and medals and four lectures, respectively, presented by ICO prize winners, Benjamin Eggleton (ICO Prize 2003), Ashok V. Khrishnamoorty (ICO Prize 2004), Milivoj Belic and Caesar Saloma (both Galileo Galilei Award 2004). About 483 oral communications (including more than 80 invited papers) and 345 poster contributions were presented during the week. In that same week, an exhibit on Optics and Optoelectronics Industries was organized at the Changchun International Conference and Exhibition Center, an impressive modern building located in the new industrial area of Changchun. Under the lemma of: "Light of science leads to the future" over more than 200 enterprises in optics manufacturing, telecommunications, and related techniques were present on the Hall. To have an idea of the dynamism of the exposition, local and national industries distributed the order of 300,000 invitations. Moreover, the banquet of the ICO Meeting took place in a magnificent park area were the most qualified tourist points are located, under an appealing Chinese atmosphere. 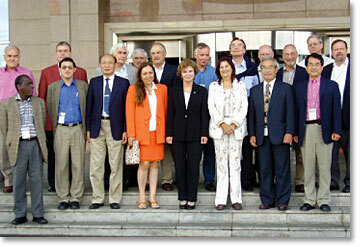 Some members of the old and new ICO Bureau at the gate of CIOMP, Changchun, China, where ICO-20 took place. From left to right, first row: A. Wagué, M. Gu, G. Jin, A. Guzmán, M. Kujawinska, M.L. Calvo, I. Yamaguchi, Y. Kim. Second row: J. Love, A. Friberg, R. Dändliker, H. Arsenault, A.A. Friesem, G.C. Righini, G. Von Bally, P. Chavel, G. Sincerbox, A. Sawchuk, T. Tshudi. ICO gratefully acknowledges Guoguang MU (General Chair), Guofan Jin (Program Committee Chair), Arthur H. Guenther (International Advisory Committee Chair), Jianlin Cao (International Organizing Committee Chair), Ming Xuan (Local Organizing Committee Chair) and their colleagues of the conference committee sessions for the considerable amount of work they did, which resulted in an enjoyable and fruitful event indeed. As it is traditional, the ICO General Assembly took place in two subsequent sessions. In it the reports of the President, Secretary, Associate Secretary and Treasurer were presented. Moreover, the various committees of the ICO Bureau presented their corresponding triennial reports. Among the activities of the General Assembly are the election of the new Bureau, for the next triennial term and the approval of admittance of new members as well as designation of location for ICO-21. In the forthcoming sections of this newsletter, summaries of these aspects are reported. As a satellite meeting of ICO-20, the 5th International Workshop on Adaptive Optics (AO) for Industry and Medicine (IWA0IM) was held in Beijing from Aug. 28 to Sept. 1, with Wenhan Jiang as Chairman of the program committee. Development of Adaptive Optics has reached the stage of extending the applications of optics from Astronomy and laser propagation to many fields of Industry and Medicine. Many new advances have been achieved in recent years. Four successful workshops on AO for Industry and Medicine have already been held in the past years. ICO highly valued the opportunity of supporting this event. Many topics were presented during the workshop, including the AO for lasers and communication, medical applications, new wavefront correctors, new wavefront sensors, wavefront reconstruction and control algorithms and hardwares, beam diagnosis, innovative systems and theory among others. To summarize, it is remarkable that this has been the first time that an ICO General Congress was organized in a developing country and the third time in an Asian country (after those in Japan and South Korea). The hospitalities of the CIOMP, of all the organizers and the city of Changchun have been extraordinary added points for the accomplished success. For the last three years, three Territorial Committees, Ecuador, Greece and Moldova have applied as ICO Members. Among them, Greece and Moldova have been accepted unanimously as members by the ICO General Assembly in Changchun. The presidents of the Greece and Moldova territorial committees are respectively Prof. Nikos Vainos, from Engineered Photonic Media Laboratory, the National Hellenic Research Foundation, Athens and Prof. Andrei Andries from the Center of Optoelectronics, Institute of Applied Physics, Academy of Sciences of Moldova, Chisinau. Moreover, Ecuador, Tunisia and Morocco have been accepted as "Associate Members". Recently, a new application for associate membership has been received from South Africa, through Prof. Philemon Mjwara from National Laser Center of South Africa, Pretoria. The Bureau has been authorized by the General Assembly to transform associate membership into full membership during the forthcoming triennium as soon as all required conditions are fulfilled. Moreover, each international Society member designates its representative to the ICO Bureau. The LAM Network appointed Prof. Ahmadou Wagué of University Cheikh Anta Diop (Dakar, Senegal) and OWLS appointed Prof. Min Gu of Center for Microphotonics, Faculty of Engineering and Industrial Sciences, Swinburne University of Technology (Australia), as its respective ICO Vice-President. In addition the OSA representative had to be now designated by the OSA Board. The International Society for Optical Engineering (SPIE) has established in 2003 the Educator Award. The latter is delivered to prestigious colleagues in recognition of outstanding contributions to optics education as SPIE instructors or educators in the field. The award has an honorarium $2,000. For the year 2005 the Educator Award has been given to Gallieno Denardo, ICTP—The Abdus Salam International Centre for Theoretical Physics, Italy. Gallieno Denardo has been very active during the last two decades for promoting optics and photonics activities in ICTP. Among these activities is the Winter College on Optics, usually held in January and February of each year, offering since 1995 various relevant topics and lectures to attendees from all over the world, and in particular from developing countries. The Winter College is an activity sponsored as well by ICO, and international societies as SPIE, OSA and OWLS. Since 2004 Gallieno Denardo is involved in new initiatives like the so called Trieste System Optical Sciences and Applications (TSOSA) advisory group. This is a new body created to help the Abdus Salam International Centre for Theoretical Physics (ICTP) to promote optical sciences in the developing world. Among its priorities, one is the development of the mentorship activities for assuring quality programs for exchange of students from developing countries in order to get specializations in reputed laboratories and research centers. ICO is also supporting this mentorship program along with IAEA, EOS, OSA, OWLS, SPIE and UNESCO. It is expected that in the forthcoming years proposes will be received from specific qualified centers to initiate this joint venture. Contact: Dr. Ekaterina Yutanova, IFMO, 14 Sablinskaya str., St. Chairs: Prof. Leonid V. Poperenko, Kiev Nat'l University & Dr. Mauro F.
Sydney Exhibition & Convention Centre, Darling Harbour, Sydney, Australia. Contact: Prof. John Love. E-mail: jdl124@rsphysse.anu.edu.au.